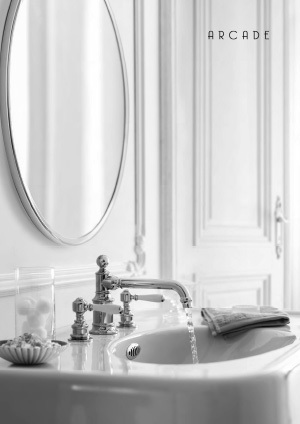 A new range of bathroom pieces with a unique Belle Epoque appearance - designed to bridge the gap between today's modern minimalist and yesterday's period pieces. A truly timeless brand set to provide the ultimate in luxury for any traditional or contemporary setting. Arcade includes beautiful ceramic sanitaryware, free-standing baths and stunning showering masterpieces. Every piece is hand finished with exceptional care using the finest materials and manufacturing process. A nickel finish is used throughout all brassware, fittings and accessories within the Arcade range, completing the luxury concept and setting the range apart, as the most acclaimed in bathroom styling. We have access to the worlds top 147 brands including Arcade. If you are interested in having Arcade Bathroom products in your home or would like these fantastic designer bathroom products specifying in your contracts then please contact our sales experts and design consultants on 0333 772 2055 or email sales@designerbathroomconcepts.com or utilise our instant live chat feature.